Donald Baker was an astute businessman. Concise and to the point, Mr. Baker was rarely distracted or caught lazing at his desk. Evidently his many years of diligent service to the company paid handsomely enough to buy a new car in 1962. 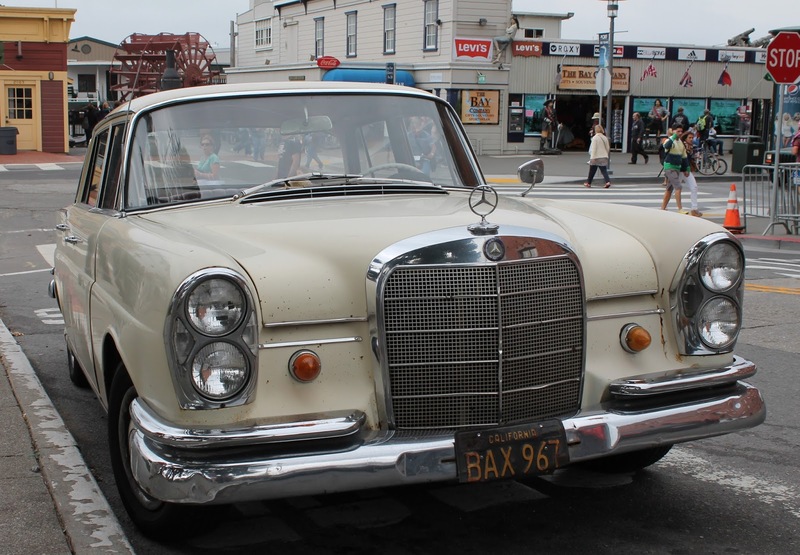 His budget was plenty; as was the selection of luxury cars available in 1962 but his Mercedes was the perfect car to suit his character. The balding Mr. Baker was hardly concerned with showing off his modest wealth. He lived in a new brick bungalow with his wife and two small children. He needed a car that was large enough to fit his wife and kids while being small enough to fit in his two-car garage. He found the new Cadillacs to be too pompous and the Lincoln Continental was far too ostentatious for his tastes. But the mildly colored four door Mercedes caught his eye while driving past one of the 'foreign' car dealerships in San Bernadino. 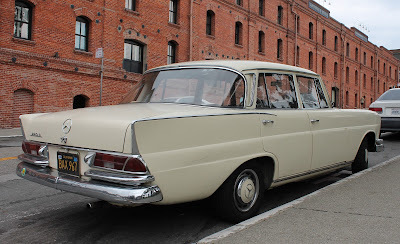 Though it's proud chrome grille and vestigial tailfins were slightly off putting, the car had an air of quality about it that Mr. Baker found quite attractive. 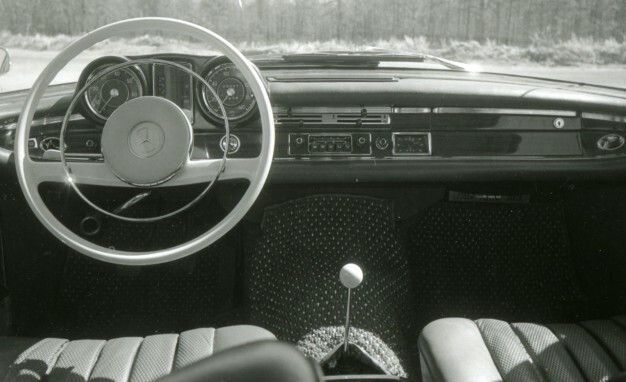 Whereas the interior of the Continental was all jet age flash, the inside of the 220S was sturdy and yet kept a bahaus aesthetic. Mr. Baker even enjoyed the ticking of the mechanical clock in the dash of the Mercedes. 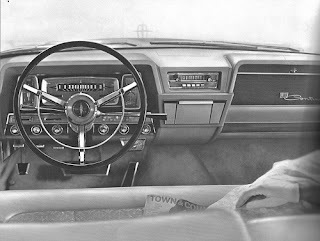 The 220S's 2.2 liter straight six might have lacked the displacement of most American luxury cars but it lacked nothing in refinement or quality. Seemingly hewn from a single hunk of granite, the OHC six was a steadfast starter and with the occasional addition of oil, ran flawlessly year after year. 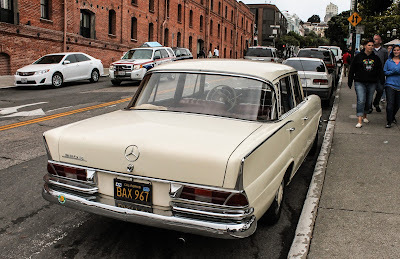 And year after year, a new registration sticker was stuck on the California black plate and the Mercedes continued to faithfully transport Mr. Baker. By the early '90's however, both the car and Mr. Baker were showing signs of aging. The Mercedes was exercised less and less often until it was unceremoniously and permanently parked after a heart condition made driving impossible for Mr. Baker. The 220S sat forgotten in the garage of the bungalow for years while the families priorities shifted. Years later, the car was rediscovered when the Baker family went through the house before it was sold. Logan, Donald Baker's grandson now drives it as a second car. It still makes admiring heads turn and its red MB-Tex seats are as comfy as ever. The old Mercedes is still with the family and still serves faithfully every time the key is turned. It's a Baker family heirloom. **Mr. Baker is a fictional character in this fictional story. I don't know who the original owner of this found car was and I don't know their story. My goal today was to create a plausible fictional narrative to enlighten people to the amazing stories some of these cars have. I hope I have piqued your interest and imagination and apologize if you feel mislead. This writing style was created and popularized at curbsideclassic.com by authors like Thomas Kreutzer. If you like this piece, I highly recommend reading some of his work. Thanks for the plug, I appreciate it. It's nice to think I may have inspired something good. Also, please check out some of my fictional work at The Truth About Cars as a part of our new "Sunday Stories" features.